Masquerading as the powerful Vatican Bishop, Cardinal David Xzytun, ultimate "Evil" has incarnated with intent to control, as puppet master, a Caesar for his new Roman Empire. 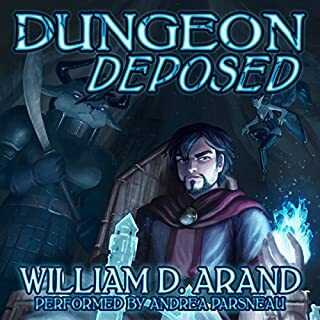 Standing tenuously on the side of hope amidst the encroaching apocalyptic doom is Dr. Paul Bradfield, a man conflicted between rational science and matters of faith regarding unexplained supernatural occurrences, and the horrifying deaths of several of his closest friends. All roads appear to lead to one inexorable horrific beginning of the end...that is...The Evilution. When the world ends on Halloween night, Jaz, a retired US Marine, thinks it's all over. His friends, his family.... They're all gone. He's alone and on the run. On his desperate dash to the desolation of North Dakota, as far away from the slaughterhouses of the cities as he can get, he encounters Jennifer, a waitress hiding in her dad's roadside diner. While they come to terms with the fact they may be the last two people alive, they discover there is something more sinister at work, and Jaz and Jennifer realize the attack was just the beginning. The overall plot of the story is interesting. Has the basic plot of an apocalyptic story with your ex-Marine badass surviving the unsurviveable with a dog, a damsel in distress, and then has demons thrown in for good measure. The demons are always kinda present but not really engaged until the last bit of the story. Then it turns all Predator and in mind my goes off the rails. Now the epilogue gets the story back onto the rails but puts it on a completely different track that makes me curious about the next story. It seems that the next one will be more fantasy with demons and angels then your typical post-apocalyptic story, not necessarily a bad thing. I wouldn’t call this a romance. While there is love between a man and a woman it is creepy love because as he says himself, he is old enough to be her father. To me it was just gross and their nicknames for each other gave me molester vibes. Same vibe you get when the weird old man up the street stares at the neighborhood girls. I can understand they think that they are the last people alive and at some point they would fall in love. Everyone should be expected to do what is needed in this scenario but to fall in love so quickly seemed very unrealistic, especially given Jaz’s background, and I found it incredibly distracting from the overall story. I assume their love for each other was used for an endgame but I think that could have been handled differently. If Denzel Washington hooked up with Mila Kunis in The Book of Eli I think it would have totally changed the feel of the movie and possibly overshadowed the rest of the story, or I could just be an overprotective father. I really enjoyed the narration. I enjoyed the back and forth between the two narrators and really liked the range of voices Michael used for the different characters. Not sure if it was intentional, but Jennifer’s spoken dialogue, voiced by Kelly, seemed like it was written by a nineteen year old which was fitting since Jennifer is nineteen. Personally I didn’t like her character, so I found her annoying dialogue fitting which eventually made me actually enjoy it. This book pulled me all over the place. The narration alone was worth the listen though. Treaters is an end of the world novel that makes you happy the gates of hell haven't opened. Survival horror is a new genre for me, and I like it. I have long been into apocalyptic stories and settings, but I really enjoyed the horror aspect a lot. This is only the first book in what looks to be either a trilogy or a series. And it centers on two survivors who make their way with a lovable pooch, finding love in hope in the darkest of places. I know Rutherford is a newer writer, but he never comes across like a novice. Go read his Neverwar trilogy and see what I mean. Treaters is a descent into despair and terror as you try to survive in a world populated by demons out for your heart, blood, and soul. Jaz and Jennifer are likable characters, and you will feel everything that they feel as they make their way in the world. The book does end on one heck of a cliffhanger, but then, this is a series so no worries. My only issue, and it is a small one is the flipping of narration. I really prefer just one person to do a book, and they can do all the voices from each gender. Having two narrators distracted me a little at first, but I got used to it. The Ables do work well together, and they are seamless in the transitions. Treaters really looks to be a great start to an exciting series. I cannot wait for the next one to come out so that I can find out what happened after the end of this book!!! Absolutely loved this book! There were a few times I almost put it down, because of something awful about to happen, but I'm awfully glad I finished it. It's a very skin-of-the-teeth pageturner. I can't wait for the next book! Really enjoyed this story a lot. Narration is fantastic. Only knock was the ending, there was obviously some supernatural on top of the supernatural going on, thought the main character's plot line at the end was a bit of a left turn, but that's just nitpicking. Great listen! Amazing story and narrations! Can hardly wait for next book! 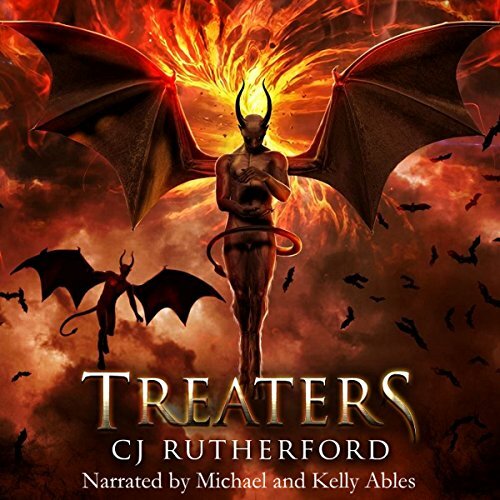 Treaters was an amazing apocalyptic tale written by CJ Rutherford and outstandingly narrated by Michael and Kelly Ables. It was unlike anything I've read before. Michael did a wonderful job of narrating Jaz's portion of the story and Kelly was terrific at recounting Jennifer's part. They each gave the characters voices a naturalness. The emotions they depicted came across as real whether it was being playful, hurt, loving, etc. Cj Rutherford did a marvelous job of developing his characters. Jaz, Jennifer, and even the dog, Tray were characters you come to love and badly want them to survive this horrific ordeal they are having to live through. I laughed and cried with them. I was terrified with and for them. I mourned with them. I can hardly bear to wait for the next book in this series. 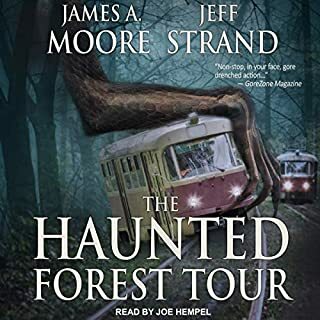 The pros in this story are well developed characters, good descriptions of surroundings and events, and believability within the parameters of the story. 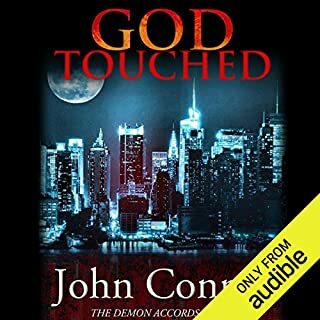 The con in this audible book was there was a duplication error of a couple of the chapters in the copy Audible downloaded me, but I just used the chapter button to bypass until I got the story back on track. I compared with an ebook copy and story is complete just with a repeat of, I think, a 2 chapter section. 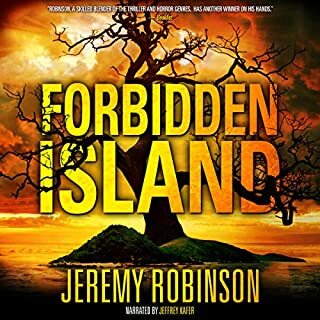 When I finished listening, I was so wowed by the ending I temporarily forgot the repetition issue until I was writing my review. The only issue I have with the story is I would prefer less profanity particularly of the f bombs that often plague it. I do understand that in real life certain events do seem to elicit some profanity (I have been guilty of it myself) but I do find f bombs particularly distasteful. I was gifted this audible copy through a giveaway I won but as I thoroughly enjoyed it I am voluntarily reviewing it. Thanks go to CJ for this amazing story and Michael and Kelly for their wonderful narrations. Keeps your attention from the start!! Different take on the end of the world story. Narrator a little different from what I’m used to but he was very good!! It's the end of the world as they know it , so Jennifer, Jaz, and Trey are thrown together as they try to understand what has happened and how to continue to survive. I loved this book so much. It is a fast paced scifi thriller with lots of humor and pop culture references. The characters were well developed and worthy of the exciting journey. The story has twist and turns with surprises. I am purposely trying not to give specific information as the less you know, the more I think you will enjoy this book. I highly recommend this book to everyone. Seriously stop reading this review, and start reading Treaters! You will not regret it. This book engages the reader and leaves you wanting more. I am excited to read what happens next. I should mention that I listened to the audio book. The narrators were perfect. Not exactly what I was expecting! Well, to be fair for some reason I thought this was a Dragon story. That said I really did appreciate the story. Interesting start to this one. Even better ending! Very glad I took the time to listen. Great post-apocalyptic book! Almost biblically apocalyptic! I couldn't put this book down! The end of the world came on Halloween night! Instead of the typical zombie story, the Treaters are demonic beings that want to rid the planet of life. Jaz, a retired Marine, and Jennifer, a waitress, and Tray, the dog, set off to find a safe place to live out the end of days. As with any great post-apocalyptic story, the dog plays a very important part. There is no better companion to have that would do anything to protect it's human! There's a bit of romance in the story between Jaz and Jennifer, but nothing inappropriate for a younger reader. I won't ruin the ending, but it was a twist I didn't see coming! I can't wait for book 2! This is the second series I've enjoyed by CJ Ruherford. Great author with a great imagination. Michael and Kelly Ables are new to me. I really enjoyed their narration, especially Michael. He expresses the emotions beautifully! This book grabbed my attention and I had several laughs throughout the book! 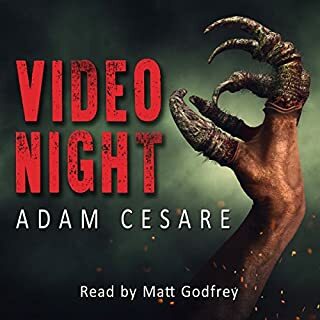 Even though this is a post-apocalyptic setting, filled with horrors and nightmares, the wording made it feel cozy, and a good book to just sit and read (listen) without a whole lot of thinking involved. Which was the first book I have ever listened to that made me feel that way, so I say it's a win! 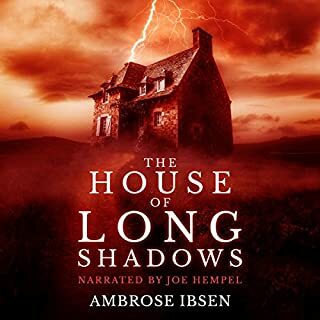 At first I thought the male narrator was a bit over dramatic, along with a few random spots throughout the book, but over all, both parts were done very well! Especially the ending and epilog! My favorite thing about this book, is how emotions were showed within Jaz Too many books, movies and stories have the men "too tough" for emotions. CJ did a wonderful job bringing in real life emotions into the characters. I can't wait to see what adventures I am taken on in the next books! Will definitely be reading this book again! Didn’t quite know what to expect having 2 narrators, but it works really well! I’m so glad I took the chance! As for the story, it’s truly gripping, intense and pretty darn terrifying at times! It does slow down a little in the middle with the ‘getting to know people’ part but I’m raring to go on the next book, I can’t wait!! This book caught my eye as it seemed to have an interesting cover art. Then the other reviews made my mind to buy this gem. I have not regretted it. I'm not going in to details but both the story and the Ables voice acting is magnificent. The backstory bits that i usually find boring had me gripped and in some instances nearly in tears. Buy this book, you will not regret it!